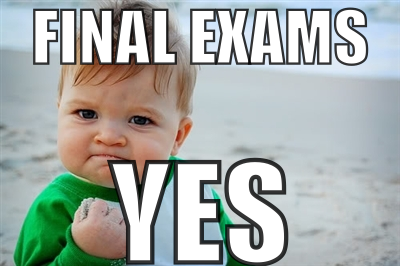 With the semester nearing an end, finals week is quickly approaching! Wait what?! Where has all the time gone? Here is my list of the 3 biggest distractions during finals week and my expert advice on how to conquer them. We all love our phones because they are able to connect us with the world and let us know what’s happening around us at all times. The problem is that with so many social media outlets like Facebook, Twitter, Instagram, Snapchat, Tumblr, Yik Yak, StumbleUpon to check, it can take hours to get updated. Even games on your phone are a terrible idea during finals week, you might as well say good bye to that G.P.A. 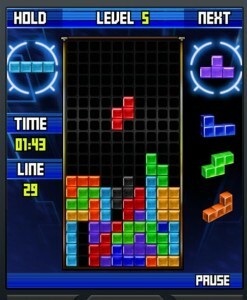 if you have any games like Tetris on your phone. HOW TO CONQUER: Get a friend to change your passwords during finals week! Make them promise not to tell you the passwords until after finals, not matter how many times you beg. This way after finals you can take as long as you like to get caught up on life. 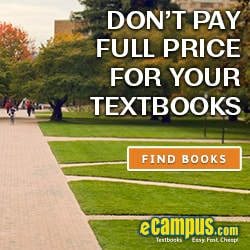 You should also check out the eCampus.com social media sites for coupons, contests and blog posts for college students. Friends or “study buddies” are great to hang out with when you have nothing to do. In fact, they are a ton of fun… but maybe not the best influencers during finals week. You always have that one friend who only has one easy final so they become the biggest distraction you could imagine. HOW TO CONQUER: The best strategy for this is to start studying early and give yourself enough time to do what you have to do. Take some time for yourself to get the majority of your work and studying done ALONE. Afterward, you can meet up with your friends to take a break at Starbucks. Without social media on your phone, you now have your study breaks with friends under control. However, the one thing harder to avoid is the World Wide Web. It’s always so tempting to get on YouTube and watch goofy cat videos for hours. This one below is hilarious but definitely not what you need during finals week. HOW TO CONQUER: Approach looking up random websites, online shopping and watching funny videos by a reward system. You study for 3 hours and then you get rewarded with an hour internet break. This way you’ll be able to get through your studying much faster but don’t forget to retain the information otherwise this reward system doesn’t work. HAPPY FINALS WEEK. MAY THE GRADES BE EVER IN YOUR FAVOR. 1. Buy a planner. If you don’t keep a planner, I highly suggest investing in one. My planner is my life. If I didn’t have my planner I would have no idea what I should be doing. If having a planner isn’t your thing, develop a system to keep your school assignments on track. Go through your syllabi and write everything down for the semester. 2. Clean sweep. Prior to the beginning of each semester, I clean everything from my room to my bathroom to my computer’s desktop. I feel so much better when everything is clutter free. Performing a clean up will start your semester off on the right foot. 3. New school supplies. Throw away your old notebooks and invest in new notebooks for the new semester. Color-code your classes to keep everything aligned. Call me crazy, but I have matching folders, notebooks, post-its and highlighters for each class. It’s a simple way for me to stay organized. 4. Set goals. Want to achieve all A’s? That’s great! Rather than just saying, “I’m going to get straight A’s this semester, set check-mark goals that you can cross off throughout the semester. I love crossing things off. Break down your classes and set goals such as “Earn a B or above on Exam 1” or “Begin paper two weeks before due date.” I always break down my papers from when they’re assigned to the due date so I don’t leave it all for one night. It is important to keep your motivation throughout the spring while still making time for fun, especially if this is your last semester in college! 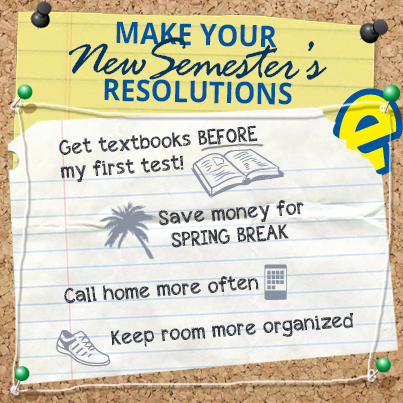 What are your new semester’s resolutions? Nobody likes to go back to school after a month long break…especially when you have to walk from your dorm room through a foot of snow! That’s why we’ve partnered with Skinit.com this semester to show you how much we care. Every day from January 2nd to January 31st, we’re sending out an eCampus.com Care Package to one lucky winner! That’s 30 lucky winners! Care Packages are valued at $250. Enter now for your chance to see just how much we care. Limit one entry per day. Make sure to share this sweepstakes with friends for additional chances to win. 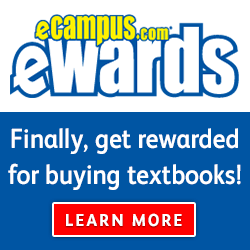 If you refer a friend and they win, we will send you a $50 eCampus.com gift card!